Professor, Evolutionary Anthropology; Director, Institute of Cognitive & Evolutionary Anthropology, University of Oxford, United Kingdom; Co-Director of the British Academy’s Centenary Research Project, Lucy to Language: The Archaeology of the Social Brain, a multidisciplinary project involving several universities, studying how the human brain evolved and the role language played. Robin Dunbar was born in Liverpool, England, the son of an engineer, but when he was just three months old, his father moved the family to Australia, “the gold mining town of Kalgoorlie and the middle of nowhere,” he says. But he wouldn’t stay in the middle of nowhere much past childhood. As a “tween,” he moved to East Africa to live with a cousin for a couple of years, which ultimately expanded his educational as well as geographic horizons. It was there a young Dunbar got “hooked” on philosophy, introduced to the subject by his cousin. “He was three years older than I, and had become interested in Bertrand Russell, the great philosopher of mathematics and peace campaigner, as well as Eastern philosophy, especially Buddhist philosophy,” he recalls. It also drew him into courses taught by such renowned professors as Nikolaas “Niko” Tinbergen—the Dutch ethologist and ornithologist who shared the 1973 Nobel Prize in physiology or medicine with Karl von Frisch and Konrad Lorenz for their discoveries concerning organization and elicitation of individual and social behavior patterns in animals—and Richard Dawkins, author of the controversial The Selfish Gene. It’s something that comes naturally for Dunbar. After research fellowships at Cambridge, 1977 to 1982; Liverpool Universities, 1985 to 1987; and teaching posts at the University of Stockholm in 1983, Dunbar landed at University College London in 1987, where he was based until 1994. He wound up devoting a lot of his time in those early years to ecology and behavior, in particular fieldwork on primates and antelope. Then, in 1994, he moved on to the University of Liverpool, where he was until last year, when he accepted the position at Oxford. Elected a Fellow of the British Academy (FBA) in 1998, Dunbar is also a Fellow in Magdalen College. 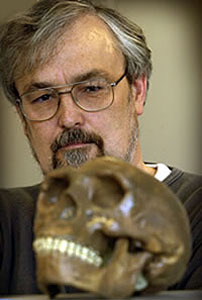 He is the author, co-author, or editor of a dozen books—including Primate Social Systems (1988), The Trouble with Science (1995), Grooming, Gossip and the Evolution of Language (1996), The Evolution of Culture: An Interdisciplinary View (1999), Cousins: Our Primate Relatives (2000), Human Evolutionary Psychology (2002), and The Human Story (2004)—as well as numerous scientific articles.